Get Out and America’s many missing black people. Yeah, we are still noticing new things about Get Out. Even now, two weeks after I first watched Jordan Peele’s sublime and inspired Get Out, pieces of it still catch and surprise me when reflecting on it, like some sort of cinematic autostereogram. Or, perhaps, a bite-sized Snickers discovered in a couch crevice after all the Halloween candy is assumed to have been completely consumed. There’s the connection between the Armitage family’s grandfather’s athletic history and the groundkeeper’s unnerving midnight workouts, which dawned on me during a conversation three hours after seeing it. And the reason for Rose’s indignance when a police officer asks for Chris’ identification, which became clear to me after writing about Get Out the morning after I saw it. And even the latent and disturbing logic behind the Armitage family’s collective push for Chris to stop smoking, which came an hour before I began to write this. This has been the most enjoyable and surprising part of consuming this movie—the process of decoding and detecting the layers of subtext and interconnected tissue woven into it and excitedly divulging these revelations with others who share an affinity for unearthing nuggets within it. 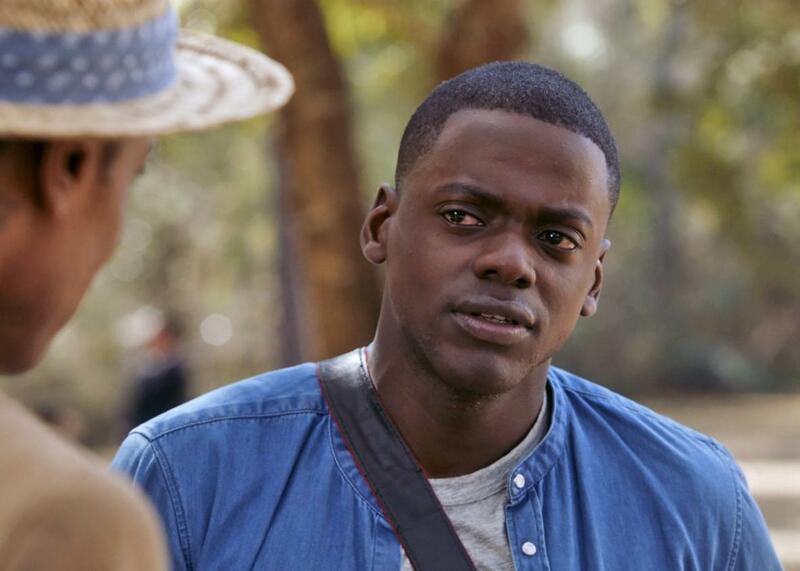 Also, as the discussion and dissection of Get Out persists, it’s natural to discover and draw connections to other films it calls to, a list that includes The Stepford Wives, Invasion of the Body Snatchers, Rosemary’s Baby, A Clockwork Orange, Avatar, Guess Who’s Coming to Dinner, and even Jeepers Creepers. The movie I keep coming back to when contextualizing Get Out, however, is actually Gone Girl—David Fincher’s adaptation of Gillian Flynn’s biting and controversial best-seller. The similarities are obvious. Both are satiric, unsettling, indicting, and darkly humorous meditations on American culture. Both exist in a hyperbolized universe that’s realistic enough to be plausible. (And legitimately scary.) And both revolve around missing people. But what compels me to make this juxtaposition is what separates them and how that separation is grounded in a very real and very depressing fact. In Gone Girl, the presumed kidnapping of the young and blond and pretty Amy Dunne captivates and paralyzes the nation. Which is what tends to happen when that happens to young and blond and pretty white women. The movie’s central plot and even Dunne’s staging of the crime and framing of her husband depend on the reliability of this truth. In Get Out, the Armitage family and their dozens of co-conspirators are able to do what they do—and are able to continue to do it for what seems to be at least a decade—because, well, no one gives a damn about missing black people. Of course, the movie takes this stark difference in how black and white people are valued and exaggerates it to comedic and horrific effect. But this type of parody isn’t possible without an excavation of legitimate and verifiable certainties. Not only does Get Out exist within a racially tinged context that specifically draws from the microaggressions committed against black people, it could not exist if the races were flipped. A movie where a black family kidnaps, controls, and auctions off dozens of white people—mostly white women seduced and lured by the black family’s handsome son—could perhaps exist as some sort of bizarro-universe thriller. But the truth at the center of Get Out that makes it so resonant and terrifying would not translate. It just wouldn’t be realistic enough. No one would believe that this could be possible, even in a pretend movie universe, because we know that the National Guard, the FBI, the CIA, the Navy Seals, Nancy Grace, the United States Postal Service, Bruce Wayne, Mike Pence, Walker Texas Ranger, and even the exhumed skeleton of Charles Bronson would immediately be at the doorstep of any black family who attempted to do to white women what the Armitages did to black men.